A brother and sister in the county recently decided to get their first library cards at WCPL. Let’s call them Jack and Jill for short. It is not known why they waited so long to get a card, but it turns out that Jill needs a rare and costly book that the library has on the shelf. Using the library for free (that’s right, free) saves Jill from having to buy the book with the equivalent of half her weekly grocery budget. Soon Jack comes by the library to pick up Jill’s rare book as well the five movies his sister has reserved online from home. Since this is his first time in the library, Jack takes his own tour to see what’s here. He sees a huge collection of childrens’ books, and notices the Launchpads which could occupy his niece for hours. He browses shelves and shelves of entertainment DVDs, locating several older movies that are hard to find. Nearby is the large area holding an extensive fiction collection and Large Print books. Jack thinks to himself, “Surely, there is more to the library than this,” and he is right. He sees the stairs and heads up to the second floor. Jack uses his card to access the public computers which offer the range of Microsoft Office software as well as photo editing and more. He discovers that there are nonfiction and documentary type DVDs on the second floor and locates two which ignite his interest. Meanwhile, Jill is thinking about their family dinner party and texts Jack requesting two cookbooks, Rachel Ray’s Look + Cook, and The Best of America’s Test Kitchen Little did Jack know, but the Library has over 50 shelves of cookbooks upstairs, including one entire 27 foot long wall. He finds both books available, with the recipes Jack and Jill both love cooking. Before leaving, Jack sees the Reference Desk and asks them a question regarding data for his business. Jack makes guitar pedals and wants to be sure he is speaking to every music place within 50 miles. He asks if there is a database that could help him. Jack gets back on the library computer and the librarian takes him through several databases available for library users. Most helpful is Reference USA, which lets him mine and correlate the very information he is seeking. Jill texts again to remind Jack to schedule time for the winter family trip to Switzerland. This prompts Jack to think how he needs to learn more about his digital camera, while also brushing up on his French and German. To save time, he asks the librarians at the Reference Desk for help. They show him how to take advantage of the several eBook connections through the library, especially READS and R. B. Digital. With his new card, Jack is able to download on his ipad, David Pogue’s Digital Photography: The Missing Manual. The librarian also shows Jack the photography E-magazines available to check out free through the READS and Zinio electronic libraries. Jack downloads immediately Digital Photography from Zinio. Jack tells the librarian, that if he ever worried the library would go out of business, he doesn’t now. “Are you as up-to-date on language learning? I need to refresh my French and German.” The Reference Desk librarian shows him the library learning site called Transparent Languages, and gets him into the German and French programs using Jack’s library card as the login. As a library card holder, you already know that you have access to a vast collection of books, periodicals, movies, and audiobooks at the Williamson County Public Library (not to mention all the other fantastic resources the library provides for the community). But here’s what you may not know: if you also have a smartphone, tablet, computer, or eReader, you can easily gain access to your library’s digital collections of eBooks, audiobooks, magazines, and more. It’s like discovering a new wing of your favorite library, full of additional content. And the digital collections are available around the clock! At WCPL, we give you access to these vast, additional resources through various apps, which you can read about on this page (http://lib.williamson-tn.org/e_library). One popular collection is known as Tennessee R.E.A.D.S. Previously, the books and audio in this collection were accessible only through the Overdrive app. Now, Overdrive has released a second app called Libby. Libby has much of the functionality of the original Overdrive app, such as checking out eBooks and audiobooks, placing holds, and sending to Kindle. Some library patrons have already made the switch to this new app, with no looking back. But there are some differences between the two to be aware of before you dive in. Let’s look at how Overdrive and Libby compare, so you can decide which one might be best for you. Designed to be simple, attractive, and user-friendly, Libby makes it easy to get started downloading eBooks and audiobooks right away. This is the feedback I read over and over, from novice and experienced users alike: Libby is so easy to use! If you have never used either app before, I would recommend you start with Libby, because of its easy setup. Libby makes managing multiple library accounts painless, whether you have a library card in another library system (for example, Davidson or Maury county), or even a household member’s card you’d like to add. All checked-out materials live on the same “shelf” within the app, streamlining the way you access your digital loans. With Libby, you can download eBooks and audiobooks for offline access. If you’re online, you can stream the audiobooks instead, which saves space on your device. Libby will also deliver eBooks to a Kindle, if you prefer. Since Libby is a new app, new features are being added all the time. Just this month, the developers added new search features. For example, you can now search by the title of a series, instead of the names of the books within the series, which sounds very helpful! If you give Libby a try, be sure to keep it updated regularly. That way, you won’t miss out on any added capabilities. As is often the case with technology, we sometimes have to choose between something that’s feature-heavy and something that’s easy to use. That’s the case when it comes to Overdrive and Libby. It’s important to know that, right now, Overdrive has better accessibility support than Libby. Libby currently lacks support for text-to-speech, voiceover, and multiple languages. Overdrive also has more amenities for the visually impaired. However, many of these features are planned for Libby’s future updates. Overdrive gives you better control when it comes to searching content. You can exclude mature content from your searches, or set your searches to show only children’s books. This is not possible in Libby. If you use Overdrive’s “Wish list” function, stick with it for now. You can “tag” books in Libby, but you cannot import your Overdrive Wish list to Libby. With Overdrive, you can stream videos from your library’s collection. 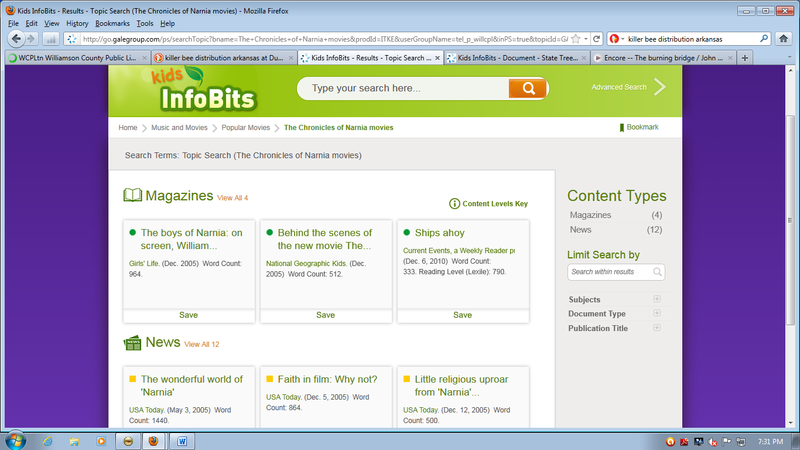 You can also access checked-out material through your computer’s web browser. Neither feature is planned for Libby. If you’d like to read more about Libby, you will find some helpful links at the bottom of this article. They include the official getting started guide, a great FAQ page, and an accessibility review. I bet you will find Libby easy to set up, and a pleasure to use. Remember, if you get stuck, you can always come in to the Reference department for help. Enjoy! Use of Ancestry.com is free In the Special Collections Department and to help you use it, here are some very important tips to remember. Pay absolutely no attention to spelling! Census takers couldn’t spell. This researcher has seen the name Jacob spelled “Jacup” on the census. Pay close attention to extra people with a different last name in a household. Frequently those listed as “boarder” were aunts, uncles, cousins, nieces, nephews and especially mothers-in-law. Pay close attention to who is living next door. The guys either married the gal next door or their first cousin. This researcher looked for an ancestor for 10 years only to find him living next door to a grandson by a different last name. Be aware that ages recorded in the census can be 2 to 3 years off. However, usually the younger the closer to the truth. By the time one got to their 80’s either he or his family members had forgotten how old he really was. Know the abbreviations for Men’s first names: Alexr= Alexander, Benj = Benjamin, Geo =George, Hy=Henry, Jas = James, Jno =John ( Why I have no idea), Patk=Patrick, Robt= Robert Thos=Thomas, Wm=William. The last letter of the longer abbreviation are usually written as a superscripts, so that you might see only the Tho for Thomas unless you look carefully for the little tiny s. Periods were usually omitted after the abbreviation. Know common nicknames and know that nicknames often rhyme. Some are very tricky. Ted = Theodore (but can be = Edward). Come join us to hunt for your ancestors! This year’s theme supplies a good reason: “Libraries Transform.” Over twenty years ago, some were saying libraries would go the way of VHS tapes, floppy disks, and beanie babies. But libraries are still going strong! Again, one big reason is how libraries transform people who visit. Please let me illustrate with a few examples. One morning as the doors open to WCPL, a very focused patron marched in and went immediately to the computer center where he started searching for jobs. After 20 minutes of what he called, “Nothing,” he asked for help. He explains how he just lost his job and desperately needed to find employment. A librarian responds to his request by leading him to a few of the better job search sites, while at the same time helping him narrow his search. This was so helpful that he found three promising jobs to apply for. But he soon asks for help again, as his computer skills were challenged by the application process. 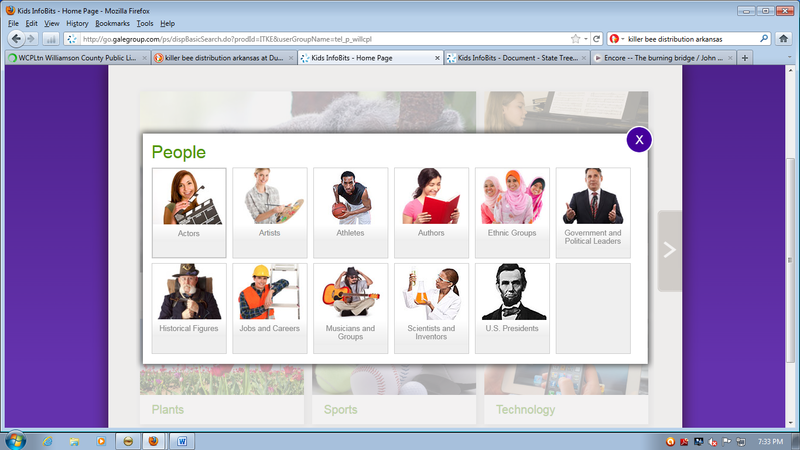 The librarian takes time to help him set up a profile and become familiar with just what the applications are seeking. Upon finishing the applications, the man stops to tell the helpful librarian, “Thanks for being so kind to me and taking time. It restores my belief in human kindness.” This patron continues to come to the library, and will never forget how a librarian took time to help transform his situation. There are many other stories I wish we could relate about patrons who experience the library as a place for transformation. They would talk about learning new skills like Excel; finding interesting books never before considered; discovering Powerspeak Languages to learn a language for their summer vacation; enjoying their first eBook; seeing a program on square foot gardening that doubled their gardening production; tailoring a resume and cover letter for a new career; finding a dyslexia friendly font; and many other stories. All would tell of how libraries transform and become very personal reasons why we celebrate National Library Week. Make your summer safer – Boat Access Points and TWRA Boating Test Proctoring! If you enjoy boating during the summer, you may have noticed that there are not too many boating access points in Williamson County. In fact, the only access point that I could find in Williamson County is an unnamed boat ramp on the Harpeth River just North of Mack Hatcher Pkwy and on the East Side of Lewisburg Pk. However, if you don’t mind heading out of the Williamson County area, we are surrounded by Rivers and access points. There are numerous access points along the Percy Priest Reservoir in the north in Davidson and Rutherford County. Toward the south, there are even more along the Duck River, which crosses the counties Maury, Marshall, and Bedford as well as passing through Hickman County in the west. Of course, these two rivers are very popular boating sites, so if you would like to have a little less company, there are a few other spots you could try. The West Fork Stone River in Rutherford County has 2 access points in total and the Harpeth River also provides a couple more access points in Davidson County. But remember that in order to go boating, you have to have your license, and if you don’t have a boating license to ride your Sea-Doo or boat this summer, you can take the TWRA (Tennessee Wildlife Resources Agency) boating exam at the library. You will have to have a library card (or guest pass) with us. Keep any mind, anyone under 18 has to have a parent or guardian with them to get a library card or guest pass. To get a library card you need a current address and a picture I.D. You’ll also need a Type 600 ticket. You can get this ticket at any sporting goods store, where you would get your boating license; the fee is $10.00. You will have to make an appointment to take the online exam, which is why you have to have a library card or guest pass. You can take the exam twice in one day; you have to get 48 out of 60 questions correct. We do have study guide books on the second floor available for free. The Franklin branch is open Monday – Thursday 9:00 to 8:00 p.m. and 9:00 to 5:30 p.m. Friday and Saturday. We also have Sunday hours—1:00 to 5:30. Call us at 595-1243 to make an appointment. Did you know that Williamson County Public Library patrons can access Ancestry.com for free while in the library? Neither did I – and I am guessing that many other people in Williamson County don’t know either. Like many people in the United States, I have a multicultural background, but have never been absolutely certain what my ethnicity truly is. I have long been interested in tracing my roots and wondered when my ancestors first arrived on this continent, but without access to the proper resources, I never really looked into it. My surname suggests that I am Scottish and I have always celebrated that part of my lineage without really knowing the percentage or who first emigrated from the land of bagpipes and single malt whisky. Also, I have been told that my maternal side is of German or Austrian descent, but no one is really sure. When I first started searching Ancestry.com for information on my grandparents, the most readily available data that I found was census records. The search tab at the top left side of the home page provides users with a number of search options, but the easiest way to get started is to simply click the green “Begin Searching” button in the middle of the page. Though I was too young to remember meeting him, I know my paternal great grandfather’s full name and where he lived. By searching his name and town of residence, I was able to locate his father’s name via a combination of census, birth and death records. I repeated this process several times, and through the historical mist, I was able to find that my fifth great grandfather was born in Scotland in 1681 and arrived in what would become the United States in 1766. My family name has apparently been in this country for a very long time and the reveal of this information somewhat diminished my feelings of a connection with the Scottish homeland. I am not going to stop enjoying single malt Scotch whisky or listening to the pipes, but maybe I shouldn’t have gotten married in a kilt…either way, I had another side of my family to research. The maternal side of my lineage has always been somewhat of a mystery. No one in the family seems to know where the names come from. The names of my maternal grandparents both suggest German, Austrian, Slovak or Hungarian lineage. I searched my grandfather’s name and with very little effort, found out that his father was Hungarian. The 1920 U.S. Census records show that he was born in Hungary and his native tongue was Slavish. While his mother was born in Pennsylvania, her parents were born in Hungary as well, with the same linguistic details. I am 3rd generation Hungarian and never knew it! Maybe that’s why I like stuffed cabbage and lekvar pierogis so much? I don’t know. Regardless, I was excited to know that I had found a relatively recent connection to my European past. And because in many cases, Ancestry.com provides users with an actual scanned copy of the documents, I was able to see that this area in Pennsylvania was a true ethnic community. The birthplaces of the majority of the people (or the birthplaces of their parents) listed on the census record were Eastern European; Austria, Hungary, and Russia. How could my mother and her siblings have grown up not knowing that their grandparents were from Hungary? The reason is probably because so many European migrants of that time wished to disassociate themselves from their past and start a new life in America. They were struggling to make a new start while making a living in a brand new country, most often doing very difficult factory work. Maintaining and passing on a cultural identity was probably not on their list of important things to do. When I was younger, I remember being told to be careful what you look for, you might find something you didn’t want to know. I grew up knowing most of my great aunts and uncles on my mother’s side of the family. There was only one uncle that I never met, who was killed in WW II…or so I thought he was the only one. Upon examining some census data that listed the household members at my great grandparents’ residence, I read a name listed that I had never heard before. A female child that was unknown to me. This mystery aunt was 2 years older than my oldest great aunt, of whom I grew up visiting on a regular basis. Who was this person? Was she the black sheep of the family that was shunned and disowned? Was she a convicted criminal that the family was keeping hidden? Maybe she was busted for making bathtub gin during Prohibition. I hoped so. That would be so cool. I was both eager and afraid to find out. I had to know who this person was and I could only hope that there was some guarded, veiled story to go along with this ghost on the census form. With anxious trepidation, I called my aunt and asked if she knew the identity of this missing relative. Without hesitation, she said, “That was grandma’s sister who died.” Mystery solved, though, too abruptly for my apprehensive curiosity. But what happened to her and why was she never mentioned? I was told that she died from a common complication after childbirth simply because she didn’t have access to the necessary medication and treatment. Wow. It had happened so long ago that she was never mentioned in my time. No romantic tales of rebellion, crime or calamity, but a somber reminder of harder times, to say the least. My paternal grandfather and many of my maternal great uncles were in World War Two. I was able to locate the muster rolls that listed my grandfather’s name and the ship he was on. (Yeah, I never heard the term “muster roll” either. It is the register of the officers and men in a military unit or on a ship. Thanks, Wikipedia.) I also found out that my maternal great uncle was killed at Pearl Harbor and I located a detailed photograph of the monument that lists his name. Additionally in the military records, I was able to find the scanned copies of WW I and WWII draft registration cards for both of my great grandfathers. The documents are hand written and include the signatures of the men. To locate documents such as these, simply type in the name of the person that you are searching and after clicking “Search”, you will see all of the results for that name. To the left of the page, there is a listing of categories, such as “Census and Voter Lists” and “Birth, Marriage and Death.” The third category is “Military.” This option will produce information on draft registration, enlistment, casualties, and gravesites, just to name a few. There is also a great deal of information on Civil War soldiers and the American Revolution. This is just a sample of the information available at Ancestry.com and a bit of my personal experience in looking for my roots. It was great fun for me searching through my relative’s collective pasts and getting just a glimpse of their lives well before I was a twinkle in someone’s eye. 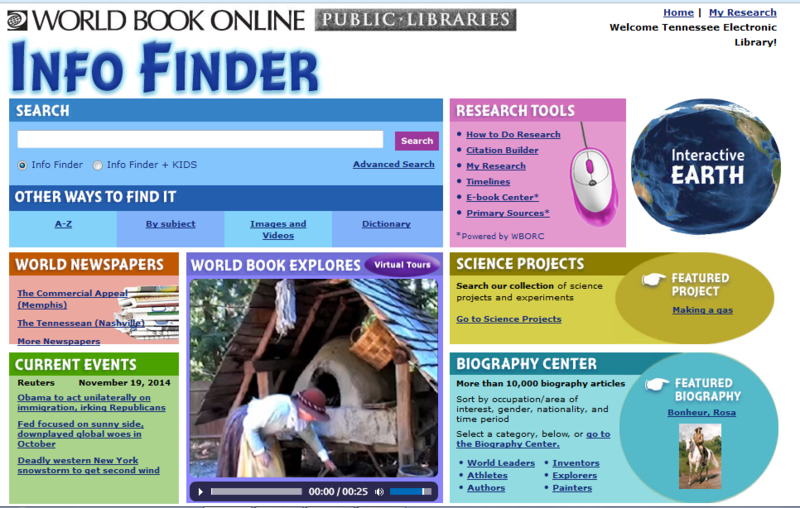 Whenever you are ready to do your own searching, come to the second floor of the Williamson County Public Library and log on to a computer or visit one of the staff in the Special Collections department and they will help you with your queries. Access to Ancestry.com is only available to patrons while they are physically in the library. On the library’s website, move the mouse over Special Collections on the left of the page and click on Digital Genealogy. From there, click on Access Ancestry Library while visiting the library. The Williamson County Public Library also offers free classes on Introduction to Ancestry.com once a month. What Good Is A Library Card? Welcome to September, also known as National Library Card Sign-up Month. And yes, I know that it feels like no matter where you go, everyone’s always trying to sell you something. But don’t worry, I’m not going to try and sell anything, because library cards are FREE! Bonus: we’ll also SAVE you money! Typically, all you have to do to get a library card is live in the area. And while there are thousands of books you can borrow, there’s also free computer use with access to software such as Microsoft Office and Abbey Finereader, amazing programs, use of highly useful databases, ebooks and audiobooks, and so much more. Patrons of the library tell us they get much more from their cards than the privilege of checking out books. I didn’t know my card could give me free online magazines from Flipster. That saves me going to the newsstand. You mean my card gives me free access to the Reference USA research database. That saves me money on my business prospecting plans. I like being able to get an older DVD free that I can’t even find in Redbox. Rosetta Stone was too expensive for me at the time, but your free online language program, Transparent Languages, helped me get ready to visit Spain. You mean I don’t have to pay $2.00 an hour to be on the computer? That’s neat you have free access. I like being able to use the library computer software. I don’t have a photo editing program so I used the basic Irfanview and worked my way into the more advanced Gimp photo editor, both on the library computer. I also used the library Powerpoint program to set up my presentation. We needed to scan our personal documents; the library made it easy, and it was free. I thought you only had a few electronic books to download on my ipad. I had been paying for ebooks the last two years. I will now be saving by using READS. We were going on a trip and wanted to listen to an audiobook. Most of the time we check out the library’s books on CD. But we just learned there are free electronic audio books too. We downloaded three and enjoyed them as we traveled across the country. I come to the library, check out the new books, and like the access to your HP printers. They are better than mine at home. I have a limit on my data downloads, so I use the free library Wifi to update my tablet. We recently got to visit the Dyer Observatory on the special night for library card holders. A great program. Tags: Lance Hickerson, library cards, library services, National Library Card Sign-up Month, What Good IsAa Library Card? WCPLtn is excited about our new Playaway Launchpad learning tablets for kids. These sturdy devices are pre-loaded with ten ad-free, high-quality learning apps that are fun and educational, and support learning objectives in school curricula. With a 7” high-definition touch screen, external speakers, and a durable protective bumper, these devices are perfect for kids ages 3 to 10+. The app packs are grouped by subject area, grade level, theme, and age. Each tablet is a new adventure. The avatar builder lets students design their own personal explorer. Discovery Points reward game play and can be used to purchase virtual accessories. One-touch reset makes it easy to pass from one explorer to the next. And the informational console gives educators analytics about time spent on tablet. These tablets are 100% secure. There is no risk of exposure to unintended content. Browse our collection of Launchpad tablets, and pick out the ones that are perfect for your kids. The Kid’s Page has some very helpful homework tools, such as TEL4U. What if I need access to a good source of information like the World Book Encyclopedia? Is there an encyclopedia that plays to the level of younger students? Is there a place I can find games for children to play? Is there a place for phonics? I want my child to practice sounding out words and practicing phonics skills. Where can I go to get Homework Help? 1. What if I need access to a good source of information like the World Book Encyclopedia? No problem. 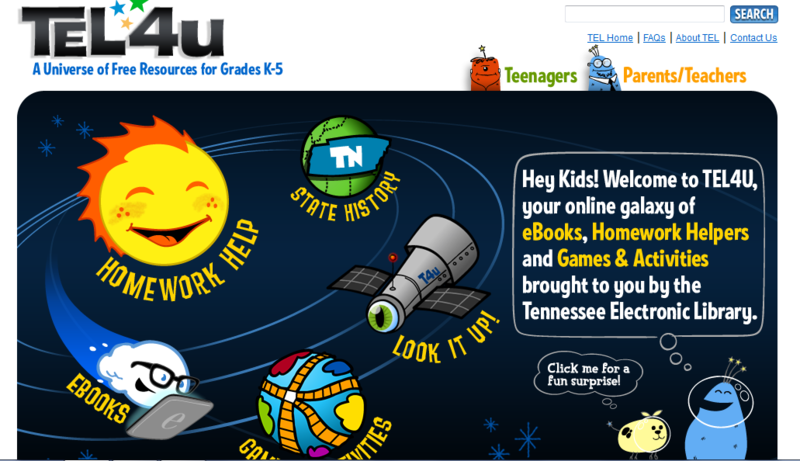 Go to the free online source on the Kids Page from the Tennessee Library Association called TEL4U. 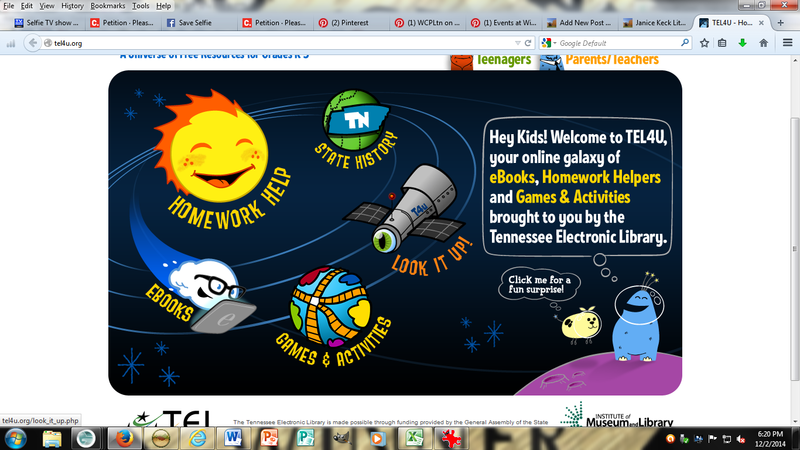 Check out the Home Screen below which shows links to eBooks, Homework Helpers, Look it Up, Tennessee State History, and Games & Activities. This is especially for grades K – 5. (For older children notice the Teenagers link.) The easiest way to get into the World Book Encyclopedia is to click on Look It Up and then choose World Book Student. Enter a word or phrase to find articles on what interests you. 2. Is there an encyclopedia that plays to the level of younger students? The link opens into a delightful Early World of Learning page with things to Read, Play, Watch, and to Print & Do. These are full of information and of interest. And don’t miss clicking on the frog. 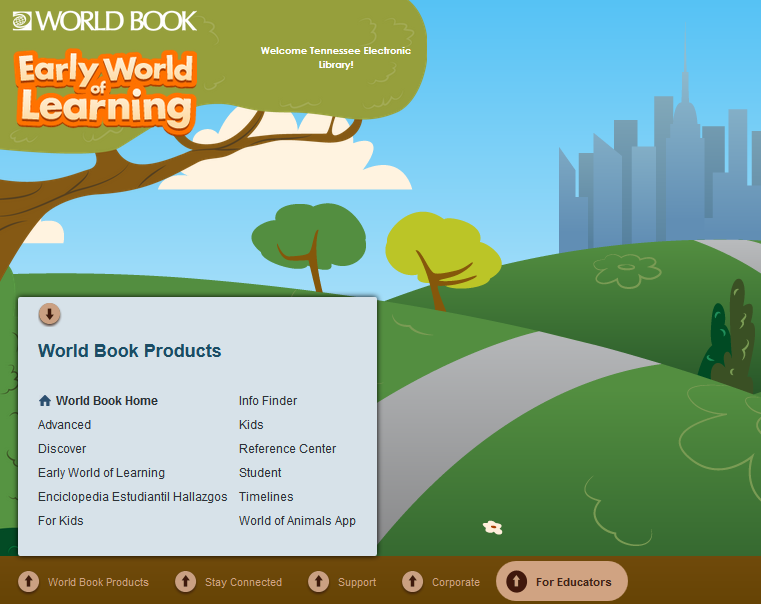 But to get to the illustrated Encyclopedia, go to the bottom left of the Early World of Learning page and click on Worldbook Products. After clicking on World Book Products, choose the top right option: Info Finder. Info Finder opens into the Encyclopedia. Enjoy browsing the many options. 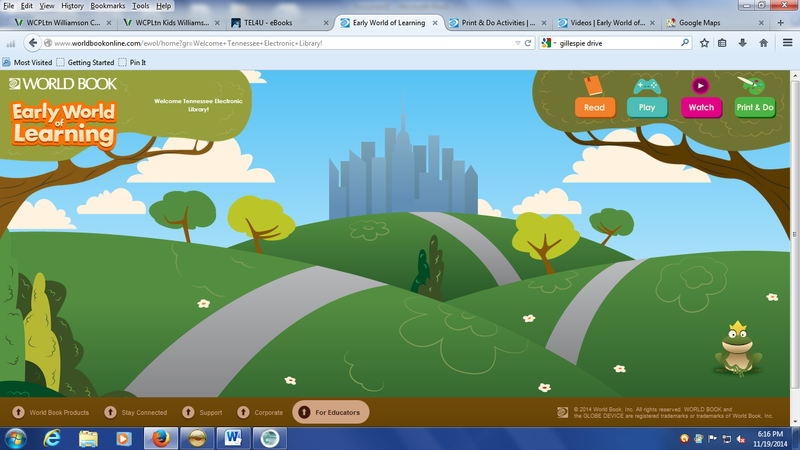 Bonus: What happens when I click on the Early World of Learning frog? 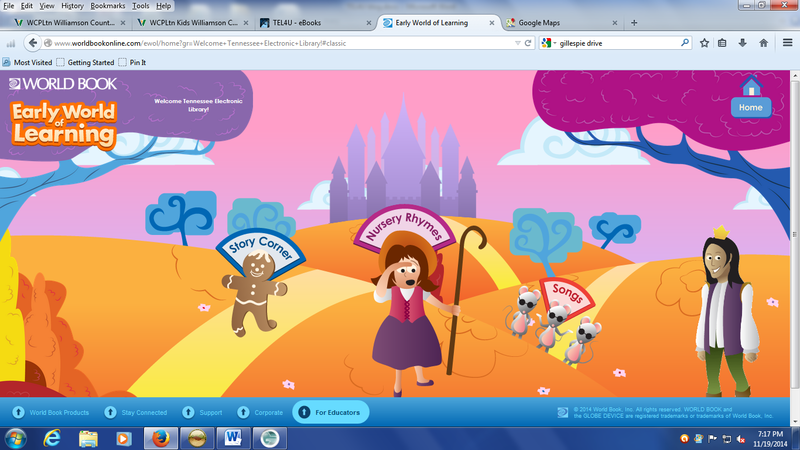 It takes us to Nursery Rhymes, Songs, and Story Corner! 3. Is there a place I can find games for children to play? TEL4U has a link called Games & Activities for several sites with games. 4. Is there a place for phonics? I want my child to practice sounding out words and practicing phonics skills. Yes. 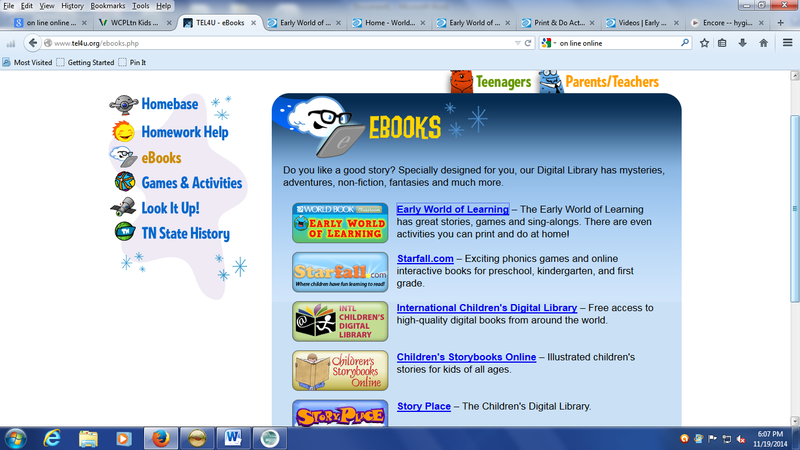 The Starfall.com site under ebooks. From the TEL4U homepage click on eBooks. Then choose Starfall.com. 5. Where can I go to get Homework Help? 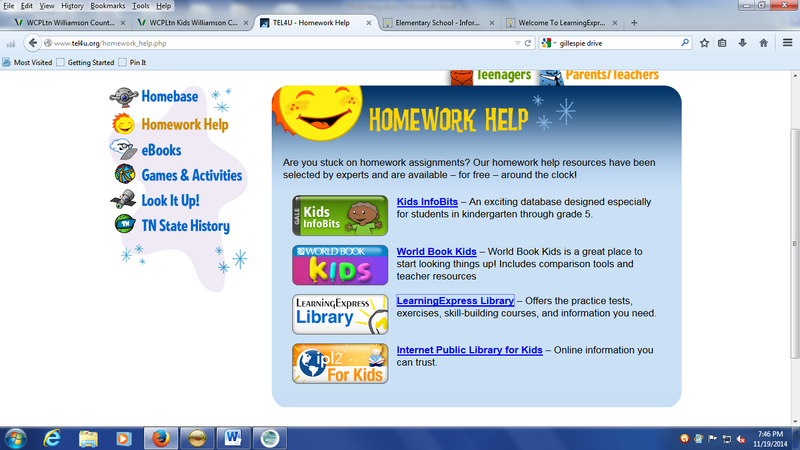 Click on Homework Helpers from TEL4U home page. 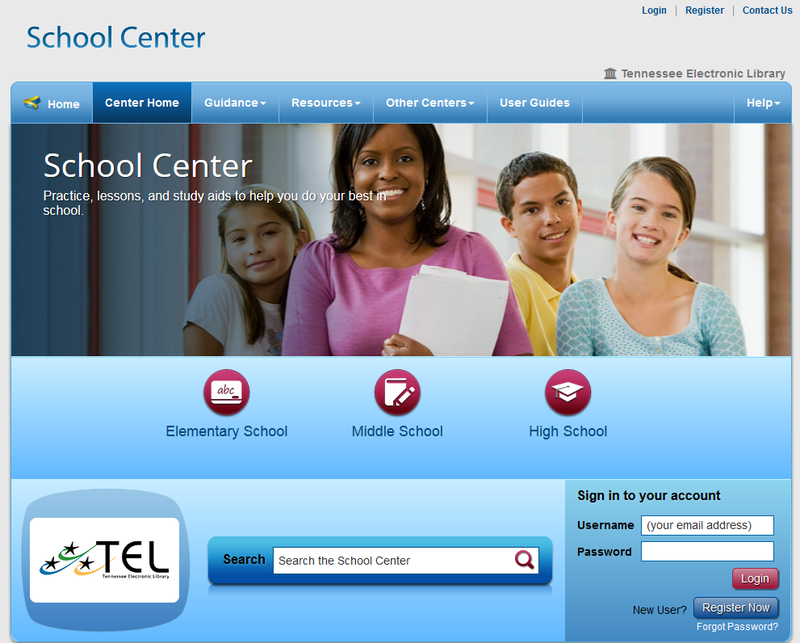 This opens access to four sites that offer help with homework. 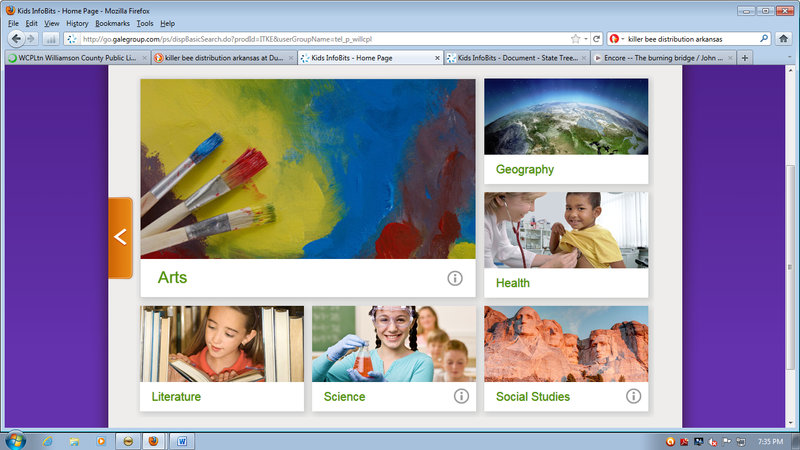 What’s in the databases for homework help? A) The Internet Public Library for Kids aims to be online information you can trust. B) The World Book Kids is a geat place to start. See info above on encyclopedias. C) The Learning Express Library is very popular with adults, but it also has homework practice in math skills and reading comprehension for elementary students. 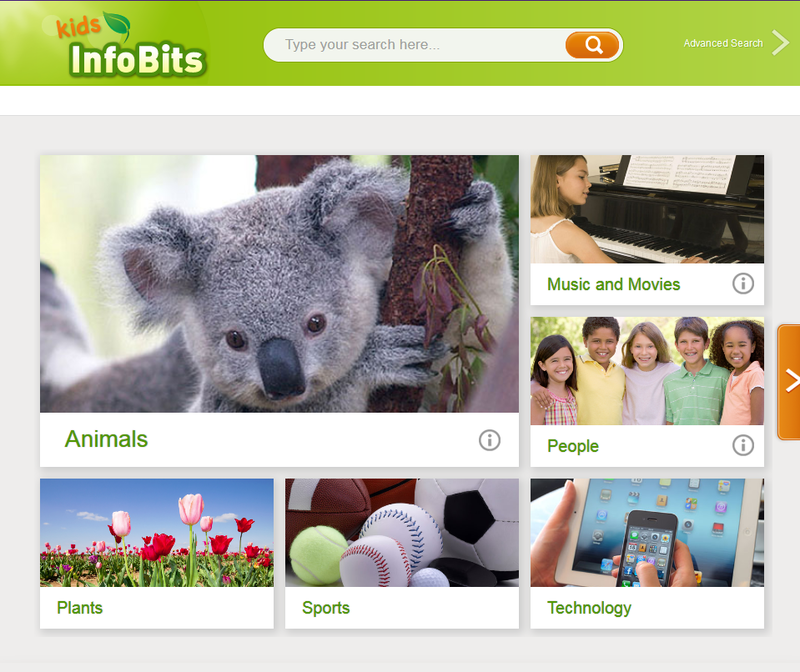 D) Kids InfoBits is an exciting database designed especially for students in kindergarten through grade 5. 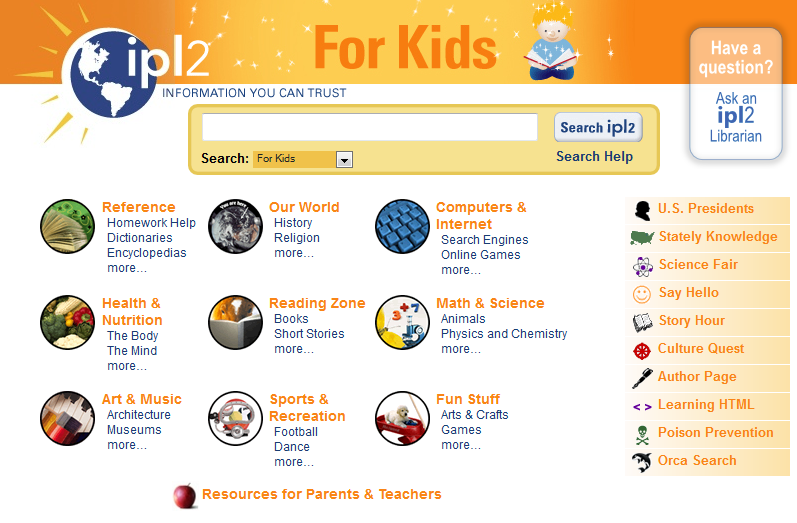 It is part of the TEL4U site, but also has its own direct link on the Library Kids page. 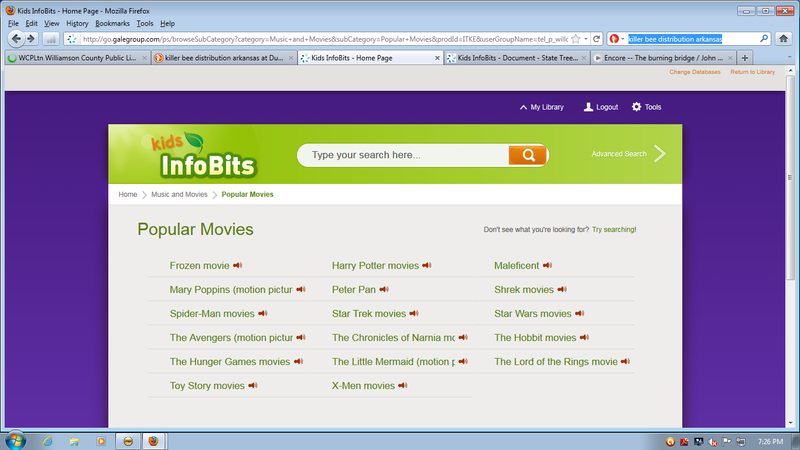 For instance, a student could click on Music and Movies, then choose Popular Movies. The student would then see the list of movies which are covered as seen below. In addition to the above options, there are also other areas for study. Students will benefit from this accessible database for homework assignments or simply browsing from curiosity. Each January, about 33% of Americans resolve to improve themselves in some way. Sadly, less than half of the people stick to their resolutions six months later. How are you doing keeping your goals? Do you need some help sticking to your New Year’s Resolutions? The Williamson County Public Library is here to help! Our elibrary digital databases may have just what you need! Learn to invest using Valueline. Find up to date information at our Health and Wellness Resource Center. Joining a book club may motivate you to read and help you fit socializing into your schedule. Check out the book clubs offered at the library. Learn about your U.S. travel destinations with AtoZtheUSA! Learn a new language with Powerspeak. To locate volunteer programs across the county visit VolunteerMatch.org. NEED HELP STICKING TO IT? Read 7 Psychology Tricks to Make Your Resolutions Stick by Time Magazine.